okay Ill bite what is a axis trigger. where do you get them? How much? Becouse I used ddrum triggers, stick on triggers, home made triggers, roland triggers, Bocus Berry triggers purple micro dot triggers and trigger perfect triggers those are the ones I can remember. I never heard of axis triggers. I want to see them and maybe try them. The EKIT is truly an Axis Percussion innovation. Now you can trigger your bass drum without the use of unreliable external acoustic bass drum triggers. Totally redesigned, this unique mechanical trigger easily mounts onto any AXIS bass drum pedal and lets you choose the exact moment and strength of your acoustic triggering. No more cross talk, double triggering, duct tape or trigger fatigue. This kit also has everything that you need to turn any AXIS A or X pedal into a stand alone electronic bass drum. Simply turn the beater around, add the supplied stopper pad and your AXIS pedal functions as a dynamic electronic bass drum pad and pedal all in one. " you need to have an Axis pedal to install this. I wonder if its possible to retrofit those to another bass drum pedal or possably build something for another pedal. Im going to check this out. My creativity bulb just went off. I use the pintech ez2. I bought it for $230. You should check it out on the pintech website. The best way to keep anything from double triggering is to have the heads relatively tight, and stuff the hell out of the shell so the head won't vibrate. If you're just going to trigger your bass I'd go with a cheaper module. The Roland one looks nice, but I don't know too many people besides a studio that would spend upwards of $1,500 on something like that. The individual Roland triggers for bass drums go for about $79 and up so if you coupled that with a module that cost $350 that wouldn't put you too much out of the bank. For me personally, I'm not a huge fan of triggering stuff except for bass drums...and even then I'm not too wild about that. The only thing I'd spend $ on is two triggers for my two bass drums and a cheap module to run it through. In a cost benefit analysis, unless every drum is being triggered on the kit and you have nine toms, roto toms, timbales, bongos, congas, pots, pans, etc., then it probably isn't worth the difference between $350 and $1,500 for a couple hundred new sounds probably only an 1/8 of which would be applicable to the bass drum category. Funny though how some people from the metal genre of music are bad mouthing triggering since it seems to be most popular in metal music in general at the moment. Recently I've seen quite a few "hordes of nords" Black Metal bands (not my thing) where every single drum is triggered (on a large acoustic kit). I then think to myself, "Why even bother with an acoustic kit? Why not just get an 'electric' kit with a bunch of pads?" The only word I can think of to describe the sound is...plastic. What are the basics for a trigger hook up? How does it work? NocturnalDrum wrote: What are the basics for a trigger hook up? How does it work? Just get a DM5 . Nuff said. Hey guys, interesting topic indeed, I had the same question and there are alot of questions answered here, but I also would only like to trigger my kicks live. Why isn't there a module designed to do just that? Only trigger kicks, just a small, relativly cheap module with like 20 different kicks stored in it. I saw the alesis midi interface, but I don't have a laptop, so I need the complete module. What is like the most cheap, but fairly good module you can buy for triggering kicks? so say you wanted bass blasts and other samples to go off during your songs, could the alesis do that? or would the roland spd-S be a better option? ALSO, say you wanted to hook up your ipod and have your triggers and your ipod playing in your ears at the same time, is that possible? myownenemy wrote: so say you wanted bass blasts and other samples to go off during your songs, could the alesis do that? 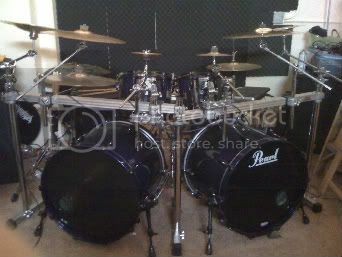 or would the roland spd-S be a better option? I think that's possible with almost any module. All of them have headphones out and I think most of them have a mix in aswell.